Farming for Cranes: Can Agriculture Save an Ancient Migration? Half an hour before sunrise, we turn into the South Unit of the Woodbridge Ecological Reserve, windows shut against the late October chill. We’re just five miles west of Lodi, but as soon as we open our car doors, all thoughts of civilization fade away as a noisy chorus of otherworldly calls rises from the marsh before us. Hundreds of sandhill cranes greet the day with an avian reveille, rousing the troops in preparation for a day of foraging in the San Joaquin River Delta’s Sycamore Slough with a steady stream of bugle calls, trills, squawks, and honks, just as they have for hundreds of thousands if not millions of years. When we first spot the cranes in the misty dawn, they’re stirring from a night of roosting in the open waters of the slough, (mostly) safe from coyotes and other predators. Within a few hours, they’ll head out to forage and rest for the day in nearby corn, rice and wheat fields. Though sandhill cranes are the most abundant and widely distributed of the world’s 15 crane species, ranging from eastern Siberia to Cuba, the Central Valley population dropped precipitously during the early part of the last century, victims of overhunting and widespread habitat loss. The transformation of the valley’s floodplains to accommodate agriculture and development deprived waterfowl, shorebirds and waders of 90-95 percent of their seasonal wetland habitat, historically maintained by late-winter rains. By 1983, California listed the greater sandhill crane as a threatened species. 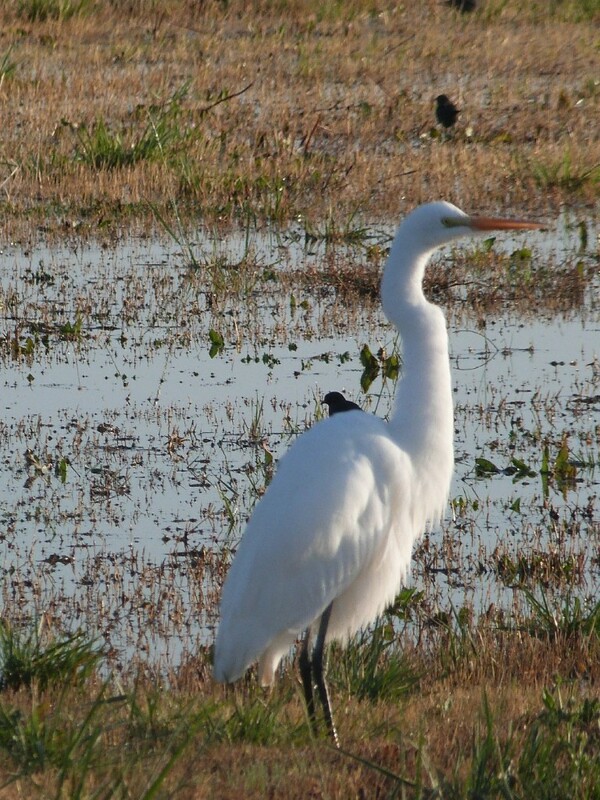 To re-create lost winter habitats, state wildlife officials and conservation organizations, notably The Nature Conservancy and Audubon, started working with rice and corn farmers in the Sacramento and San Joaquin valleys to identify management practices that would benefit both the farmers and wildlife. For decades, farmers burned their fields after harvest, a cheap way to destroy crop residue and control disease and pests. But the practice, which generated hazardous air pollutants such as hydrocarbons and sulfur dioxide, was banned in 1991. Farmers turned to post-harvest flooding to decompose husks and stubble in their fields with the happy albeit unintentional consequence of creating high-quality habitat for waterbirds like the crane—a result that may explain why millions of water-adapted birds still use the region each year despite the catastrophic loss of wetland habitat. Concerned about ongoing habitat loss in the region and to show how intentional flooding and managing fields after harvest could benefit migratory birds, The Nature Conservancy bought Staten Island, just west of Woodbridge, in 2001. Though crops include corn, tomatoes and wheat (not rice), Staten Island now serves as a working example of what wildlife-friendly agriculture looks like. Some fields are flooded to provide roosting spots safe from coyotes (it’s easier to hear approaching predators when they splash in the water) while others retain leftover grain to feed the overwintering birds. Well aware that flooding fields can prove expensive for larger farms, a recent study published this month in Agriculture, Ecosystems and Environment evaluated different water-management practices to find the optimal balance of farmers’ costs and wildlife benefits. Although shorebirds, ducks and waders prefer different water depths for foraging and roosting, the researchers found that even one-time flooding can provide benefits to winter migrants while reducing the costs of more water-intensive management regimes. With climate change models predicting reduced precipitation in the Sierra Nevada and Central Valley, the finding demonstrates that it’s still possible to support water-sensitive wildlife in farming regions in the face of limited water availability. It’s important to note, however, that cranes face a much higher risk of predation if water levels drop too low. We saw scores of cranes foraging in the corn fields in Staten Island last week, an indication that cranes and farms can co-exist. But loss of habitat remains a concern, as the past decade has seen more vineyards and orchards move into grain fields historically used by cranes. With most wintering cranes concentrating on private lands in the valley, the future of this Pleistocene throwback will depend on the willingness of landowners to work with biologists to manage the land with wildlife in mind. 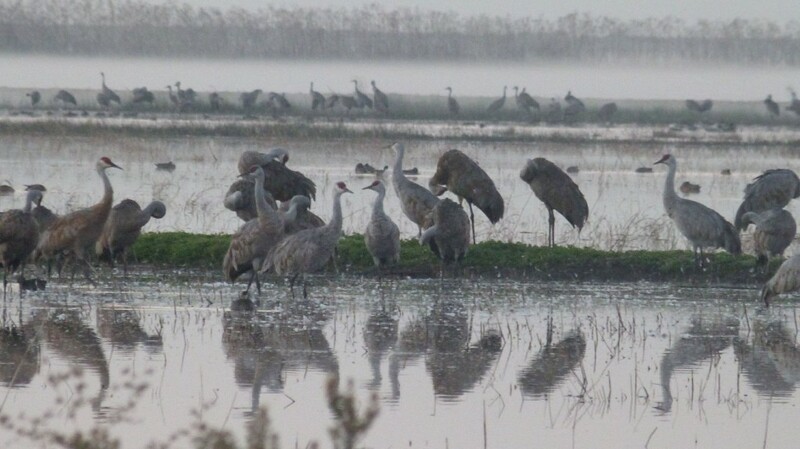 Lodi celebrates the annual influx of avian visitors with a Sandhill Crane Festival, November 1-3. You can sign up for guided tours or follow this map to venture out to Cosumnes River Preserve, Staten Island or the Woodbridge Ecological Reserve (also known as Isenberg Sandhill Crane Preserve) on your own. The best time to see cranes is around dawn and dusk.